The cause of psoriasis is unclear. Signals from a defect in the immune system may result in an overgrowth of skin cells. Because the cells grow faster than they can be shed, they “pile up” on the skin’s surface. The excess skin cells are thought to cause the silvery white scales that are characteristic of plaque-type psoriasis. The doctor will ask about your symptoms and medical history, and perform a physical exam. Your skin and nails will be examined. There are no specific blood tests or diagnostic procedures for psoriasis. Sometimes a skin biopsy will be done to confirm the diagnosis. 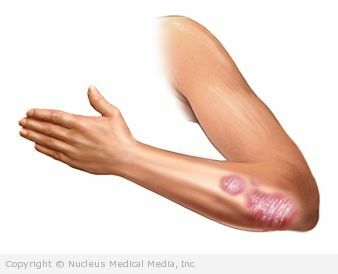 If psoriasis covers more than 30% of the body, it is difficult to treat with topical medications alone. Daily, short, nonburning exposure to sunlight clears or improves psoriasis in many people. Sunlight is often included among initial treatments. A more controlled form of artificial light treatment (UVB phototherapy) is often used in cases that are more widespread. Alternatively, psoriasis can be treated with ultraviolet A (UVA light) and psoralen. Psoralen is an oral or topical medication that makes the body more sensitive to light. This treatment is known as PUVA. Phototherapy can be very effective in controlling psoriasis but it requires frequent treatments. It may cause side effects such as nausea, headache, and fatigue, burning, and itching. Both UVB and PUVA may increase the person’s risk for squamous cell and, possibly, melanoma skin cancers. It is unclear whether UVB increases the risk of skin cancer. Systemic retinoids — Compounds with vitamin A-like properties taken internally may be prescribed in severe cases. Retinoids can cause birth defects, and women must diligently protect themselves from pregnancy for several years after completing treatment. Systemic retinoids are often combined with phototherapy for increased effectiveness and for their property of being protective against squamous skin cancer. Newer medicines include biologic agents, which affect a part of the body’s immune response. For example, ustekinumab (Stelara) is a recently approved drug that targets certain cells in the immune system that cause inflammation. Avoiding physical trauma to the skin, infections, and cold, dry temperatures may help reduce flare-ups in people with the condition. Your doctor may advise you to avoid certain foods if they appear to make your psoriasis worse.